Please direct any questions or comments concerning Sullivan and Carter County trails to BCHET Facebook page. Directions: Hwy 44 north from Bluff City or south from Bristol to Hickory Tree Grocery. Turn east on Flatwoods road and follow until turns to gravel, go another ~1 mi to 4-way gravel intersection and park along the road. Ride 0.3 miles west (right, if you come from Hickory Tree) of the intersection to where the trail turns left off the gravel road into the woods, just past the power line. The trail is blazed yellow. Description: Single track trail leading 2.2 miles to the crest of Holston Mtn. Steady climb with some narrow switchbacks towards the top. Trail is rated “difficult”, so horse and rider should be experienced and conditioned. Power line openings give extensive views of South Holston lake and mountains to the north and west. The trail ends at forest road 202 which runs for several miles along the crest. Update: A connector trail from the eastern end of the Morrell Trail to the Holston Mountain Trail has been approved and construction will begin soon. Several other trails are under consideration, including a connector from Taylor Ridge to the crest near the Morrell Trail, and redesignation of Holston Mountain Trail from the Fire Tower to Flint Mill Gap. Funds from a timber sale in the flatwoods area will be used to construct a trailhead parking area near the western end of the Morrell Trail and improvements to the Flatwoods horse trail. Directions: Hwy 44 north from Bluff City or south from Bristol to Hickory Tree Grocery. Turn east on Flatwoods road and follow until turns to gravel, go another ~1 mi to 4-way gravel intersection and park along the road. Description: There are several access points to the trail from the Flatwoods road (Forest Service Road 87) including the western end of the trail, and the eastern end where it intersects with 87A. The closest access from the parking area at the intersection is to go about 0.3 miles south on 87 and follow the Morrell Trail for about 0.25 mile to the intersection of the Flatwoods Trail. The trail follows the contour along the base of Holston Mountain. The terrain is moderate, rocky in places, some steep hills but no major elevation change and is primarily single track. It is blazed in yellow. The length is 5.4 miles. At the eastern end, the trail intersects with and continues along gravel roads 87A and 87B. Loops can be made using other forest roads in the area such as 87 and 87D. Refer to the National Geograhic map for locations. This trail links: the intersection of Forest Service Road 87 and gated Forest Service Road 61101 to Big Gap where it intersects with the West Holston Mountain Trail (Trails Illustrated trail #2020). Description: ca. 4 miles of wide trail with beautiful views. Parking can be found along Forest Service Road 87. The trail begins ca. 200 yards beyond the gate on gated road 61101, and goes off to the right. Directions: Elizabethton, TN off Highway 91. Heading away from Elizabethton the trailhead is just past Unaka Elementary School. Look for the large brown Forest Service trailhead sign on your left. Description: Leads to 36 miles of interconnected trails (old road beds, single track trails, and Forest Service gated roads). Large, easily accessible parking lot (not indicated on the Trails Illustrated map). Note – please do not clean out your trailer in the parking lot. Thank you! Description: 4 miles of trail. The current Trails Illustrated map shows the trail terminating at Forest Service Road 4071, whereas it in fact contiues over this road and ends at the terminus of the Morell Trail (Trials Illustrated trail #47) on Forest Service Road 202. Description: Wide trail with good tread, a short section of fairly steep grade. The trail runs through an old zinc mine. Directions: From Elizabethton, take Highway 91 towards Stoney Creek, look for the large brown Forest Service sign which directs you to turn left onto Rainbow Circle. Description: Six-mile long gated road with approximately two miles of single-track connector trail. Parking for about five trucks and trailers is available. There is also a connector to the Little Stoney Creek Jeep Trial (ca. 3 miles long). Description: 1 mile trail that is a hard up-hill pull, but a good wide trail. Desecription: The Chestnut Flats Trail has been extended with two new short sections as of September 2010. Beginning at the Griffith Branch Trailhead go through the gate and bear right in 100 feet onto the trail. In a little over 1 mile you will cross over the gated road you started out on. Continue approximately 100 yards and cross over the road again. Continue along new section of trail for 200 yards where you will intersect the old trail and follow it until you reach the hitching post along the original road you started out on. A left turn will take you back down the mtn to the trailhead. Go right and in 1 mile Furnace Branch Trail leads off to the left uphill. Travel 1 more mile and you will intersect the Rye Patch Trail at a second set of hitching post. Links the Griffith Branch Trailhead to the large hairpin bend in Forest Service Road 5081. 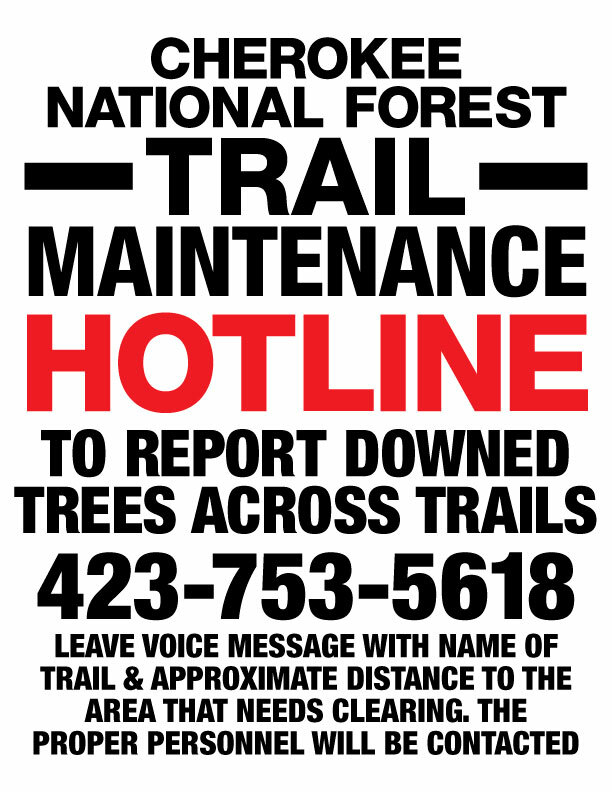 Additional riding: Forest Service Road 5081 provides ca. 6 miles of gated gravel road with a gentle gradient.